Last Wednesday, the National Institutes of Health began recruiting volunteers to test the swine flu vaccine. Manufacturers are rushing to make it to market before the swine flu rebounds in the fall. The first wave of shots is to be tested on healthy adults, but once safety is assured, they’ll look to try them new vax on babies as young as 6 months. However, it seems that the government is simultaneously rushing the vaccine while protecting the pharmaceutical companies from lawsuits. NIH researchers say they must test on little ones, as this flu seems to disproportionately affect children, from those who are school-aged to teens. For the seasonal flu, babes under two and the elderly are harder hit. This new set of vaccines will consist of two shots, given 21 days apart. After a month, each shot will be able to be tested for efficacy. Researchers will also look for allergic reactions. It’s going to be very, very close. What a way to put the public at ease! Tell me again about the “pandemic“. Totally eases my mid. 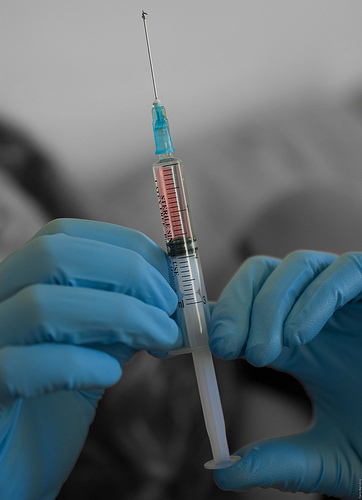 Pandemic + vaccine that’s tested too quickly and not for long-term efficacy? Awesome. It’s not a radically different vaccine from what they already get anyway. Wow and Gee whiz! Hey, you’re already pumping your child full of vaccines! Try our patented swine flu protector! Image: yanivba on Flickr under a Creative Commons License. « Blogher 2009 Recap: Michael Schott Interview Exclusive. Dr.Harry W. Diehl was the discoverer of Cetyl Myristoleate. Best known for his Award winning research of CM8 and its great effectiveness in the treatment of osteo-arthritis symptoms.